LED video wall technology is increasingly being used on streets and in other public places. The reason for this is the improvement of LED tile quality and the endless opportunities for expanding a video wall without bezels. The pixel pitches are becoming smaller and smaller, leading to substantial improvements in the image quality of LED video walls. Even at a close range, the image remains sharp and clear. The number of LED tiles that can be connected to each other is endless, meaning that there is no standard size for a video wall. As far as mounting options are concerned, no standardization (VESA) set has (yet) been adopted. Vogel’s has closely followed these developments in the market and offers a new universal range of mounting options. 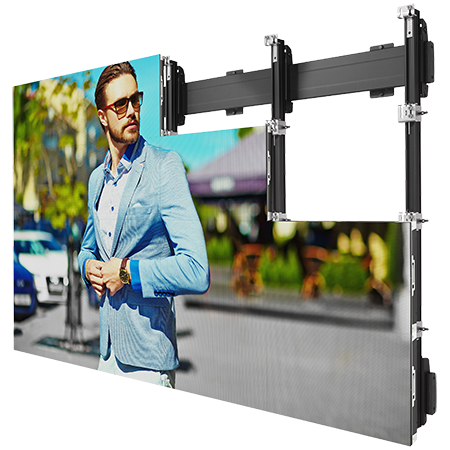 As the new universal LED video wall mounts are Connect-it compatible, flat to the wall, ceiling and floor options can be supplied.